This week’s Poster of the Week is ‘Too much of a good thing’, by John Henry Lloyd. It’s a great example of the early graphic posters commissioned by Frank Pick for the Underground group and very much reflects the changing nature of poster design at the time. Prior to 1908 publicity materials largely featured letterpress, text-based designs of various typefaces, which provided a rather confusing and visually overwhelming sight for potential passengers. When Frank Pick joined the publicity office in 1908 he began commissioning graphic posters with eye-catching designs, leading to the Underground group becoming a key patron of the arts and leader in the field of poster publicity. Pick was very aware of the power of the poster and employed a ‘soft-sell’ approach, understanding the potential of posters to generate goodwill between viewers and their environment. 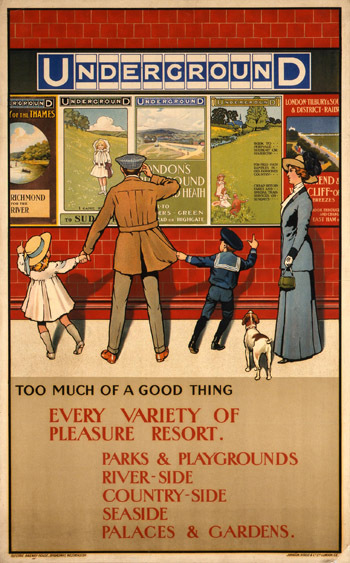 Posters such as ‘Too much of a good thing’ show the potential of the Underground to provide an escape from the urban realities of inner city living. Lloyd produced a number of posters for the Underground group throughout 1910 to 1911, additionally designing posters for the Great Western Railway. Here, Lloyd depicts a family exploring their options for a day trip. Interestingly, the posters featured within this poster are actual examples of the Underground’s destination posters. Their inclusion celebrates the abundance of destinations in and around London that can be reached by Underground. Over 100 years later, the same message rings true. With school holidays in full swing, it’s a fantastic time to get out and about – whether it’s a trip to London Transport Museum or into the countryside.